Pastor John Shepherd was an adjunct faculty member of GFI Counseling Institute. He eventually left that pastorate and devoted his life to reaching the Maasai in Kenya. John’s mission trips there began with the old men–the “Nyankusi”–which in turn opened the door for the gospel to their communities. Through Calvary Road Ministries, thousands have received salvation through their oral, chronological Bible evangelism. A video message of his on Exchanged life and Missions is available online in the GFI Solomon Lecture Series. To hear an audio sermon series on the Abundant Life by John Shepherd, visit GFI’s web site, under “Resources / Audio Channel.” These MP3 audio messages can be downloaded to play at your convenience on a portable device. Jesus said,”Come to me, all you who are weary and burdened, and I will give you rest.” Yet, most Christians are worn out from all work they do. Does the life God wants for us consist of doing more, more, more? Are we experiencing “God’s Rest”? This audio series is a fascinating study from the book of Joshua comparing the crossing of the Jordan River to the believer’s crossing over into the Spirit-empowered life, that has has a lot to do with rest. 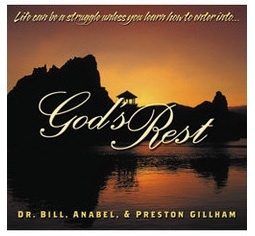 This is a teaching series by Bill, Anabel and Preston Gillham. Click here for the free audio MP 3 download!